MADE FOR PROFESSIONAL NIGHT DUTY! Made of high quality ABS engineered plastic, this unit functions as a very powerful high voltage (200K) shock stun gun and a extremely bright flashlight in a very small and light weight package. Very powerful and loud discharge will surely scare away any potential attacker. 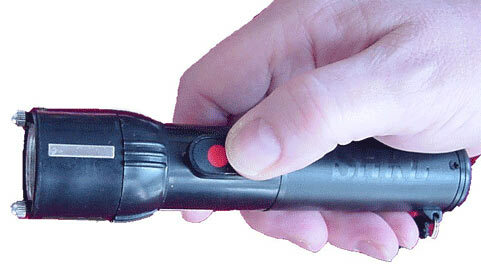 The Mini self-defense flashlight features ni-cad built in storage batteries and includes recharger. Uses the latest electric "pulse" technology. 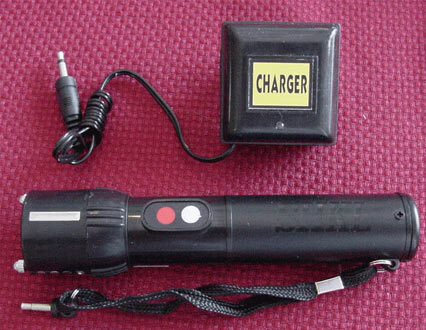 Perfect for home use, law enforcement, bail recovery or any situtation that would call for a high powered mini flash light with a stun gun self defense combo. Charges in 4 hours. Size: 6" long and 1" diameter. Copyright: 2009, Thomas Investigative Publications, Inc.